Will Oden Elected President of the 5th Judicial District Bar - Ward and Smith, P.A. It's a new era for North Carolina's Fifth Judicial District. 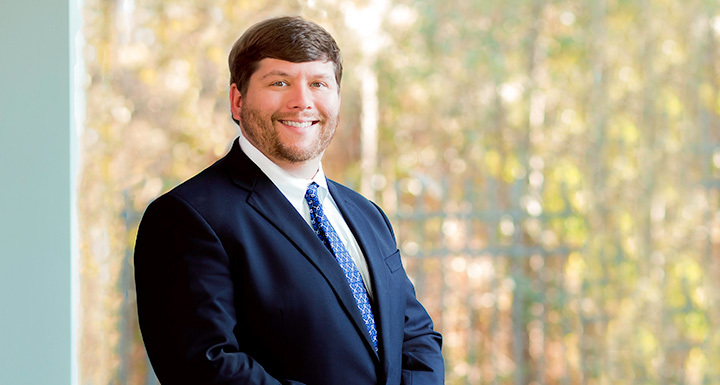 Will Oden, a labor and employment attorney at Ward and Smith, was unanimously elected President of the Fifth Judicial District Bar during its November 2017 meeting held in Wilmington. "I'm honored to be elected to this position by my peers," said Oden. "I look forward to serving the District and carrying out the mission of the State Bar." Litigator Ryal Tayloe feels Oden is a natural-born leader. "I have known Will since before he became an attorney as we are both from Washington, North Carolina. He and I have worked together a number of years," Tayloe said. "I never hesitate to get Will involved with a legal problem or any other project as I know that he will be fully committed. Will is a 'can-do' person who will do a great job as the President of the 5th District Bar." The Fifth Judicial District is one of 50 districts across North Carolina. It encompasses New Hanover and Pender counties. Oden will work as a liaison between the Fifth Judicial District and the North Carolina State Bar, which is responsible for regulating the legal profession in North Carolina. Oden's term will run for a year, until next year's annual meeting. Oden previously served as the Fifth Judicial District Bar's Vice President. He also is a past President of the New Hanover County Bar Association and the Craven County Bar Association.